Boutique-style without the four figure price? The Artist 15 looks set to be a new classic. Compact, portable and great tone at lower volume levels. Price. It can become a little flubby when wound right up. It's been just eight years since Blackstar's Frankfurt debut. Fast forward to today, and the Brit brand is firmly established as a major global force in amp manufacturing, with an impressive user list and a broad catalogue covering practically any musical need. As you might expect, high-gain amps feature in abundance for 2016, and Blackstar has added two much-anticipated new Artist Series combos. "The concept behind the Artist Series was to create an affordable boutique amplifier that's within reach of gigging guitarists," explains Blackstar's Joel Richardson. "The Artisan high-end, hand-wired amp range is incredibly popular with many pros, so we've recreated the tones of those amps, and added features that gigging guitarists need, like channel switching, reverb, speaker-emulated outputs and a proper effects loop, as well as making them very pedal-friendly." Drawing on the Artisan's vintage tone and style cues, the Artist combos also reflect modern trends, with dual-channel low-gain hybrid valve/solid-state preamps driving a dual-6L6 output stage, which powers one or two 12-inch Celestion V-Type speakers. Both the 15 and 30 combos have simple, understated styling. Ply cabinets covered in seamless heavy-duty vinyl combine with a custom vintage woven paper speaker grille cloth anda gloss black control panel. The electronics are contained in a vertically mounted, open-ended tray chassis, which is robust without being too heavy. Unlike the Artisans, the Artists are printed-circuit-board based, with one large board holding all the main components including the front-panel controls, and a smaller one for the rear-panel connections. The boards are very high quality, double-sided and through-plated, with a typically neat layout featuring a mix of conventional resistors and capacitors alongside miniature surface- mount stuff and bases for the ECC83 preamp and 6L6 output valves. Everything looks robust and built to handle regular use; the preamp valves are deeply recessed and held by large plastic grommets, which helps reduce noise pick-up, but makes routine replacement less easy. They also have DC filament supplies for the preamp valves -a feature normally found on high-end boutique designs - which keeps AC hum away from high-gain audio signals. The Artist 15 uses cathode bias, as opposed to the fixed bias found in the Artist 30. The front panel controls are easy to use. Channel 1 has a simple volume and tone control arrangement, while Channel 2 has standard gain, three-band EQ and a master volume, together with Blackstar's familiar ISF control, which continuously varies the EQ network from traditional British to USA response. The front-panel tour finishes with a global master volume and level control for the digital reverb. Rear-panel features include a series effects loop with switchable levels, a speaker-emulated line out, a choice of speaker outlets and a footswitch jack for the supplied footswitches: with a single-button channel changer for the Artist 15. Overall, the amp looks smart and purposeful, with a style that manages to be vintage and modern at the same time. Switching on, the first thing that impresses us is how free of noise this amp is. Hum levels are practically non-existent, while the hiss you often hear on high-gain channels is so far in the background it's practically inaudible, even at whisper levels. We tried out the amp with several different guitars, including an old Strat fitted with regular low-ish output Duncan Alnico Pro II pickups, a PAF-loaded Les Paul Standard and an Ibanez AFJ95 archtop jazzer. Channel 1 is a very clean, low-gain affair with clarity and transparency that brings out every nuance of the guitar you plug in. The single tone control works smoothly to add or remove just the right amount of high frequency, making this channel very easy to dial in for any guitar. As well as sounding great for bright single coils, Channel 1 can be warmed up to provide some superb jazz tones. This works well on the Artist 15, where the cathode-biased output valves have a rounder and slightly less dynamic voice. It certainly teams nicely with our Ibanez archtop producing a fabulous jazz sound, enhanced by the Artist's digital reverb. Swapping to the Strat reveals astonishing treble clarity balanced with a tight bass and warm midrange. If Channel 1 is clean, then Channel 2 is the Artist's 'nearly clean' channel. Here, with a fully featured EQ network, there's a lot more flexibility and the ISF control makes dialling in any sound very easy. There's just enough gain to take a Strat with regular low-output pickups into a mild crunch, but for serious overdrive sounds, an external pedal is needed, and that's an intentional part of the Artist's design logic. On many amps, the focus is often on high gain, but there are many players who want just a touch of drive combined with a dynamic touch-sensitive response, and the Artist 15 is perfect for this right out of the box, with many subtle nuances to enjoy on the gain control. "The Artists are open-loop [no negative feedback] designs," comments Blackstar's MD, Ian Robinson. "So there is some clever EQ in the preamp that's needed to control the highs and lows properly. That's done with high-grade op-amps, it's just a better solution. However, the preamp overdrive effects are all-valve." The Artist 15 shapes up as a great small gig and home amp, as well as a solo guitar backline par excellence. We tried a variety of drive pedals, including vintage, budget and high-end boutique, all of which drove the Artist well, without any issues. The bigger amp sounds particularly impressive with the Les Paul - reproducing the PAF's complex highs better than many top-dollar boutique amps. There's a generous 'sweet spot', where the power amp starts to really cook and the touch- sensitive dynamics make for effortless soloing. It seems many players are returning to simple non-master-volume vintage amps and using pedals for their drive sounds. If that description fits you, then Blackstar's new Artist series could be a real revelation, combining a vintage-inspired tone experience with modern features like the superb digital reverb. It is amps like this, dialled in for select tones, which often end up exciting us more, reminding us of those 'Eureka' moments when we picked up a guitar and plugged it into an amp for the first time. 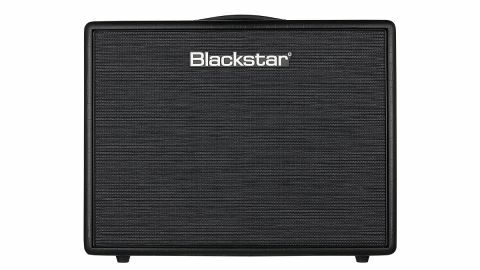 Blackstar's Artist amps have real character, but without the reliability issues that affect many older non-master-volume products. Blackstar doesn't have this niche to itself, of course - there are some sizzling competitors for the Artists, but most of them fall into the boutique bracket, typically costing twice the money, or perhaps more. That makes the relatively modest asking prices a real steal.